Kimberly Feehan-Ponte has been a kindergarten teacher and tutor for twenty-six years. She has a BA in Early Childhood Education. She has a MA in Education and a MA in Educational Leadership. She is a certified Reading Specialist. Clearly, education is an integral part of Kim's life! She believes that success in reading is the cornerstone to all educational success. Because this is so important to Kim, she felt compelled to open her own reading camp, Kimber's Reading Express, in 2010. Kim's three R's are: Rhythm, Rhyme, and Repetition. 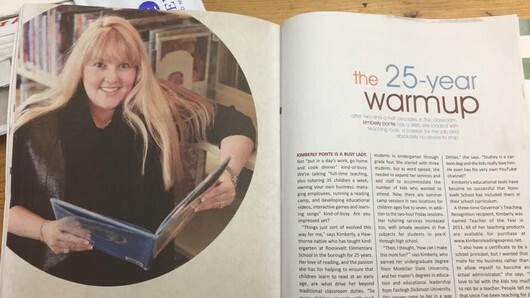 Through her many years of experience with a wide variety of readers, Kim has found that songs, rhymes and fun, are the keys for her students to remain motivated and to achieve success. She uses the onset-rime approach when teaching students to read. Kimberly formulated her own "ditties" to insure that her students have fun while learning how to read and decode words. She decided that today's "digital natives" would benefit from an educational and fun way to learn difficult word families. Kim has created, "Dudley's Ditties...Read to Succeed" computer game & app, Dudley's Ditties Reading Express you tube channel, and "Sound It Out" song CD to assist emergent readers, English Language Learners, and those with learning disabilities.